clouds, moon, sunsets, and the occasional sunrise. That make is new to me. A formidable beast. The wide sky makes it look small. I like to take pictures of machinery, too, and I think they have their very own beauty. Cool picture with wonderful sky! 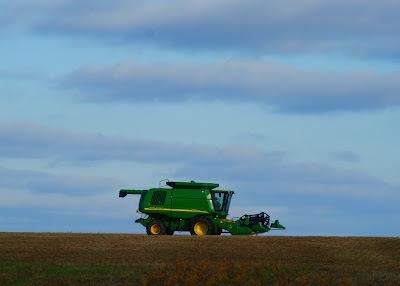 Great farm skywatch shot, I thought it was a moon buggy.lol. It screams girl it screams and it's a beauty too. Nothing wrong with a pretty piece of farm equipment. And when there's a pretty sky behind it, all the better. That sky is gorgeous, too. Misty: Definetly a great sky with John Deere Green in front. Great shot. I'd title is "America's Heartland"
I'm with you there. It's a beauty.